Make it Bright 'n' Shiny Clean! No nasty chemicals in your home! We clean your ovens and cookers with good old fashioned "elbow grease" so no nasty chemicals come into your home. Our fully trained technicians have specialist equipment and tools to ensure a perfect clean every time! It only takes a moment to call and book your oven clean, so give us a ring and we can brighten up your kitchen with a shiny oven that will look just like new! We cover from Littlehampton to Eastbourne and from Gatwick across to Tunbridge Wells. We love to clean all types of ovens, cookers and Agas so whether it's an electric hob oven or a gas cooker we'll get your stove back to the bright 'n' shiny state you'd like to see it in. All our oven clean prices include cleaning your oven rack, pans and even replacing blown lightbulbs, we will have your oven back to near showroom quality in no time! We don't just clean ovens and cookers, we also clean microwaves and grills so please call us if you've got better things to do than scrubbing away at nasty, greasy, burnt cooking equipment. We love cleaning all that stuff for you while you get on with your day. Call us on 01273 245 385 to book your appointment, it will only take a minute! Or why not email us on info@brightnshinyovencleaners.co.uk? However greasy your oven is our expert oven cleaners will have it looking gleaming, fresh and new in no time! A dirty oven is a horrible job that nobody wants to do but we're here to take the oven cleaning chore away. It might surprise you to hear that we actually enjoy oven cleaning. 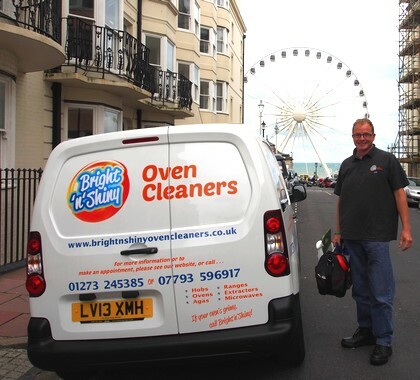 We'll get you booked in and be round to clean your oven or cooker in no time. It's not expensive to get your oven cleaned and for most people there are better things to be doing with your valuable time. Our oven cleaners are friendly and tidy, we don't bring any harsh chemicals into your home and we can tackle any kind of electric or gas oven, however dirty it is. We've seen some really filthy ovens in our time with burnt on cooking residues and layers of hard to shift grease but our professional techniques will make sure your oven, cooker or stove ends up as bright and shiny as it was when it was new. People have their oven cleaned for all sorts of reasons, maybe its a flat or house you are renting and you need the cooker or stove cleaned between lets, maybe the cooker has just built up regular hard to shift cooking stains through long use or maybe it's that time of year when relatives visit and you want everything to be clean and fresh. Whatever your reasons for wanting a clean oven and hob we're happy to do the job for you.